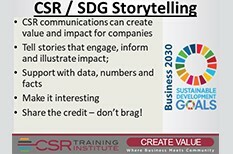 CSR communications should be interesting, engaging and use stories to illustrate impact, results, challenges and more. Support with facts, sure, but please don’t lead with them. BORING! Storytelling is a tool that’s been used since the beginning of mankind to change hearts and minds. Storytelling is so important and works so well because it helps to connect human experiences to outcomes using an approach that is engaging, relatable, and memorable. CSR and sustainability communications can leverage additional value and impact (including business impact) from CSR budgets and activities, but only if used strategically and effectively. Effectiveness is nearly always enhanced through engagement, and good, illustrative stories drive engagement. As a rule I emphasize the importance of holding CSR projects to the same value creation criteria as other projects, and that often involves facts, numbers and data. And while this is obviously important, many audiences you want to reach will simply not be engaged by only numbers, facts and data. Sure, you must include some data and details, but you also want to tell stories that connect the audience, stories that highlight people, impact and results. If your CSR project is impacting the lives of people that can make for engaging stories— those are the details that people will connect with on an emotional level, and push them to want to learn more. It will help to create and emotional anchor for your reputational capital; much more than a set of numbers or facts. To do this you need to combine a compelling narrative with numbers and data that clearly communicate your goals to an audience in a way that makes them “want” to buy-in to your program. One suggestion I give clients is to consider having a third-party publish a case study about a CSR project. This will help your story reach more people, circulate further and add credibility. Bringing a third-party into the mix also adds another voice to the story. What you lose in editorial control, you make up for with the added credibility and circulation. And, if you have a third-party that knows the CSR space, you can likely get strategy and execution feedback as well. 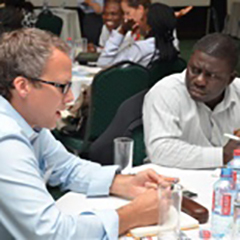 At CSR Training Institute we understand the process of introducing Corporate Social Responsibility into your business strategy can seem overwhelming. That’s why we are here to help. If you are struggling to move forward, we will work with you to cut through the confusion and help you align business, social and environmental performance goals.